The last time I had been to Delhi, I had gone back with a resolution to shed all my inhibitions. And well, in my very next visit, I had literally returned to the city with my ladylove. I had certainly made some strides. At the fest, her friend was a great help. She kept giving me tips whenever she got a chance. “Vipul, the other day you told her that she is not beautiful, haan?” she asked me when my ladylove was busy talking with some old school friend of hers. “No, I didn’t. For me, she is the most beautiful girl,” I replied defensively. “Oh, didn’t you say that the guys only talk about beautiful girls?” she delved further. Those words reminded me of that particular conversation. Since the day we had started talking, she kept asking me odd questions. “What do the guys in the college say about us?” she had asked one day, referring to herself and couple of her friends. “Not much, they are busy discussing the beautiful chicks,” I had replied nonchalantly. Obviously by that I meant girls who believed more in revealing than concealing. Maybe, the choice of words was not right. But then she should have realised that beauty lies in the eyes of the beholder and in the eyes of a nineteen year old male beholder, there can only be one meaning of beauty. But now talking to her friend, I realised this had offended her and offended her badly. “Well, but she should know, I like her so much. I never meant it that way,” I clarified to her friend. “Yeah I know, but you should be careful. You can’t just say that to a girl,” she replied with a halo appearing on her head or maybe I just imagined that. After all, she was passing on some important gyan to me. I couldn’t be frank with my ladylove, I realised. We spent the remaining day basking in the festivities and magic of the fest. I also got an opportunity to attend my first dance party with her. That had always been my dream as being in different branches, we never had a common party. On this wonderful day, I even preferred to ignore the fact that she had introduced me to a couple of her friends as being her batch mate, rather than a friend. What difference does it make, I had told myself. As the night fell, she and her friend left for her aunt’s place. I wished she could stay through the night too but I was happy for whatever wishes the otherwise sadistic God had already fulfilled. The next day, my group was returning back home while I had to visit my sister who had just returned from her training in Mumbai. She was staying at a cousin's place who had a birthday the same day. There was a family get-together planned for the evening and I was looking forward to meet all my relatives living around the city. I knew she would send a practical reply telling me not to wait for her. However, deep inside I wanted her to ask me to stay. After half and hour or so, my cellphone beeped. “Vipul, I had a great time today, thanks to you. I would really like if you could be there with us tomorrow too,” she had messaged back. I had to stay behind for my ladylove. The next three hours were spent waiting for her arrival. With nothing better to do I kept sitting at a corner reminiscing the previous day and fantasizing about the day ahead. Finally she arrived and I woke up from my day dreams. However, as the time passed, she looked pretty disinterested in talking to me. As many times I tried to start any conversation, she preferred to deviate from it. She was more interested in what was going around and when we failed to get passes to an event she wanted to attend, she became pretty restless. This was not what I had remained back for, waiting for hours for her arrival and delaying meeting my sister who I had not met for six months. “Yes,” came a harried answer. There was a limit to my patience and I wished a good bye and left hurriedly. Moving towards the hostel where I was staying, I kept cursing myself for the stupid dreams I had seen of a perfect day with my ladylove. On my way, I got a couple of calls from her but I didn’t answer. Finally, I had to yield when her friend called me. Hearing that word, I suddenly forgot that I was annoyed and hurried back to the auditorium where I had left them. Walking back, I realised how far I had walked by then. I had already lost my heart in love but now it seemed, I’ll lose some pounds too. I saw her sitting on the pavement and sobbing innocently. I felt like slapping myself for hurting her. “I am sorry Vipul. I turn a bit agitated at times. I didn’t mean to hurt you,” she apologised to me. But, it was I who felt like apologising instead. “No, I am sorry for behaving like this,” I replied and soon we were smiling again. “You two are mad,” said her friend amusingly and we set out to further explore the dying fest. As I had to leave for my cousin’s place to attend her birthday party, I prepared to leave after some time but they insisted me to stay. We made an arrangement that first we’ll go to a neighbouring mall and from there, her aunt’s driver will drop me off at a suitable place from where I can reach my destination quickly. The next couple of hours flew by quickly. Soon, it was time to leave. I hurried to a card shop in the mall to buy one for my cousin. Her friend accompanied me. “So, buying a card for her, haan?” asked her friend. “No, actually, I am buying it for my didi. It is her birthday today.” I answered plainly. “Oh! So you won’t give any gift to her?” she exclaimed. “It never occurred to me yaar. Should I?” I inquired innocently. “Ofcourse. Come I’ll help you,” she replied and we started searching for something worthwhile. As we drove towards the spot from where I had to take an auto, I kept looking at her stealthily. She looked beautiful as the lights of the moving vehicles fell on her tender skin. I loved this woman and I wanted her to be mine. Soon the car halted and she too got out to bid me a farewell. “Hey Vipul, thanks so much. I am really sorry if I hurt you unknowingly,” she said affectionaltely. “It was my pleasure yaar. See, here I got something for you. Thanks for making these two days so special for me,” I replied handing over the wrapped gift to her. As I was turning my back to negotiate with the auto richshaw driver, I could see her literally jumping in joy and showing the gift to her friend who was sitting in the car. She had loved that gesture. Her friend had guided me well. By the time I reached my cousin’s place, the party was over and everyone had left. However, one such family gathering can be sacrificed for the sake of the future family that I desire to have one day, I told myself and soon fell asleep, tired from three consecutive days of fun. I returned from Delhi in a couple of days. Just like the previous time, this time too, the city had a strange effect on me and I realised why it is known as Dil Walon ki Dilli. I made up my mind to propose her again. That smile and way she had reacted to my gift convinced me that finally, it was the right time. However, as I reached the college next day, I had turned pretty indecisive. The excitement had slowly worn down as I started thinking about the repercussions. However, a close friend of mine convinced me to give it a try and also discussed about it with her friend. It was decided that her friend will accompany her to a restaurant and I’ll meet them there. So finally, I was sitting with her at the corner table of the restaurant and her friend had just left to attend to an imaginary phone call that she had just received. “I need to tell you something,” I applied the first gear. I could sense that she could sense that something sensitive was coming up next. Thereon, I applied the fourth gear and started expressing my love to her though I never used the word love explicitly even a single time. All the while she kept looking at me with her beautiful big eyes, sipping into her colddrink with a straw. She looked pretty cute doing that. However, before I could proceed to the fifth gear, she suddenly interjected and applied the reverse gear. Now she continued and I just kept nodding. I could see my dream castle crumbling down and I could just stare helplessly. She had rejected me earlier but that was understandable and on phone, that too through messaging. “Well, we girls just love gifts,” she had replied plainly. “Hey, you all right na,” she asked as we got up to leave. “Yeah, yeah, I am fine yaar. As it is we are friends,” I replied sheepishly shifting to the neutral gear and we soon left for the college. Though the proposal and the subsequent rejection happened in a very cordial manner, the next one year was full of crests and troughs. One day, we were on talking terms and the very next day, we even failed to acknowledge each others’ presence. Soon, I realised that there is a thin line between ego and self respect. Sometimes to safeguard my so called self respect, I used to turn pretty egoistic and couldn’t help blurting out my frustration in the meanest possible words. Frustration was bound to creep in with chances of a breakthrough looking pretty slim. Such outbursts were always followed by the ‘We don’t know each other’ phase. Even she had her own mood swings. At times, she could get annoyed on simplest of excuses or not give heed to my number of phone calls while at other times, she used to be the one who took an initiative to end the troughs. However, I started realising that she won’t ever accept my love. I wanted to chuck her out of my mind but all the efforts went in vain. I kept myself busy in extracurricular activities, establishing and working in different college and city clubs. Well, academics were not my cup of tea, so keeping myself busy by programming JAVA applets was not on agenda. However, whatever I tried she always remained at the back of my mind. During one of the troughs, I even made up my mind to search for some living distraction. And hence I landed up on a blind date and some stupid phone chats too. But that was not my cup of tea. I needed her badly just like a kid craves for Playstation 3 these days. “Hey, she’s looking at you only,” said a friend of mine while we were sitting under the sun one fine afternoon. I turned around to see but by the time I could meet her eyes, she had turned her gaze towards her friend sitting alongside. This was something that happened too often. I had noticed her from side of my eyes watching me with her beautiful big eyes as I talked to any girl. During such troughs, I knew she was keen to talk to me and so was I but the specific quarrel that had landed us there stopped both of us from approaching each other. However, a simple sms or an email from the other person after gap of a month was enough to thaw the differences and we were back on talking terms. The monsoons had ended and her birthday was just around the corner. Thankfully, the rains had washed away our differences and we were going through one of the highest crests of our odd relationship. So I spent a whole week, preparing a mammoth card for her and choosing a suitable gift. And well, she just loved them. It was on her birthday that we went for a movie for the first time and well, I drove her to the multiplex. It was for the first time that we were alone in a car. Yeah, yeah, without any of our dads/moms/sisters accompanying us. Ofcourse, her friends were also joining us there though they came separately. Every first is a special occasion when you are in love. At least I was in love. However, how could the sadistic God see me spending some quality time with my ladylove! So, the same day her sister was to leave for abroad and her parents were accompanying her till New Delhi. Even she wanted to go but they insisted her to stay back. So, my ladylove spent most of the time outside the hall talking to her sister and parents and when we finally got out she was all gloomy. I felt like giving her a comforting hug, telling her that I want to wipe off all the gloominess from her life and cheer her up all the time. I wanted to tell her how much I love her but it was not an opportune moment, I knew. Upon returning, I messaged her a number of times and even called up a couple of times to inquire if she was fine. However, she didn’t reply. The next day in the college too, I could see her pretty disturbed and wanted to talk to her. However, whenever I tried to approach her, she never responded well. As the day proceeded, I myself turned pretty gloomy thinking about my worthlessness in not being able to cheer up my ladylove. Things kept simmering up and I became pretty restless. It was an ultimate recipe for disaster. I approached her finally and took her aside to the parking lot. There looking into her eyes, I started blurting. I told her how I could not see her sad, I told her how I wanted to be her pillar of strength, I told her how it pained when we didn’t talk for weeks together, I told her how I had tried to wipe her off my mind, I even told her about my blind date and other deviations and how they strengthened my belief in my love for her, I told her how I wanted her desperately by my side, I told her how I had made some important decisions like opting my college because of her, I told her how it was important for me to hear her decision as I had some tough career choices to make, I told her how I could not see a future without her, I told her how I had tried my best to restrain myself from saying all this, I told her whatever I could. I kept on saying and she listened patiently. Finally, when I was done, she just replied, “Vipul, you know my answer. I cannot commit anything about the future,” and she left. I knew I had made a blunder. I knew that when I had proposed her for the first time through a message. I knew that when I proposed her for the second time after returning from Delhi. But despite that, I had done it for the third time. I was not ready to learn from my mistakes or maybe, I did not want to. I was not content with her friendship. I would have preferred to be a stranger than being a friend. However, being a stranger was not that easy. So, I could not give up the odd friendship we had. Upon returning, I sent a long customary “I am sorry” message. I didn’t expect her to reply right then but to my surprise, my cellphone beeped soon. “It’s alright Vipul. I am not mad at you,” was her reply. I was happy for the fact that atleast she understood my position, though I felt sorry for the whole affair. It was Saturday the following day, so the college was off. I kept trying her number the whole day as I wanted to apologise in a more decent manner. However, she didn’t pick up the phone. That obviously made me anxious. Finally, it was at night that she replied to a message I sent her. Well, that reply, actually changed my life. “Hey, what happened? You said, you are not mad at me, yesterday. Then why are you not talking now. I said yaar, I am sorry. I just fail to restrain myself.” I had written. “Vipul, I said that because I did not want any discussion yesterday. Still, I am not fine and don't know if ever, I will be. I might want it or not but still I have to respond to you every time despite whatever you do because you always make such a scene out of everything,” was what she had replied politely. I was shocked. My face went red. I could feel my cheeks burning. Droplets of sweat came down my forehead. I could feel the goose bumps. I was literally shivering. Ten years that I had known her came flashing by all of a sudden. That cute little girl with pony tail in front of whom I went dumb, that shy girl who couldn’t even say a hi at the tuitions, that bold avatar of her that gave me the “I’ll have to tell papa” threat, that comforting girl who told me how excited she was about me shifting to her branch, that sweet girl who concurred that she had been stupid not to talk to me all these years, that excited girl who literally jumped when I gave her a worthless gift, that beautiful eyed girl who stared at me when we weren’t on talking terms, that compromising girl who could approach herself to end those silent phases. And suddenly I came to the present. I could just see a girl who could deny our very friendship that I thought somehow existed though odd in nature, and blame me for creating unappetising situations for her all the time. At least, I couldn’t deny that friendship. So like a good friend, I replied her back. I don’t know if she again tried to make up for it or not. Although she did approach me a couple of times like she used to do earlier during the troughs but I’ll prefer to think, even those were my illusions and she never wanted me in her life. I somehow spent the last one and a half year in the college seeing her everyday and dying from inside everyday. But I had promises to keep. Nearly three years have passed since then. Today in the morning, I finally saw what I had been expecting to see one day. News Feed on my Facebook homepage carried her numerous pictures. Everyone was busy commenting on them, congratulating her and wishing her well for this new phase of her life. Even I wish her well from the bottom of my heart though I preferred not to comment. We might be on each others’ Friends List but have never communicated since then. She was the one who I had always dreamt, will be mine one day. And after so many years, finally here she was; tying the knot with someone else. 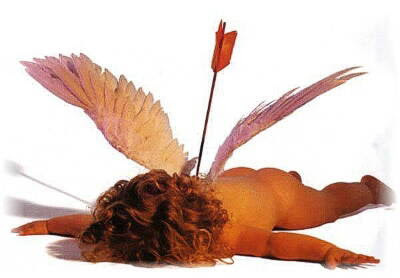 All Cupid Tales do not have Happy Endings! You may also like to read a related poem, I wrote some months back - The Sophomore Days! This is a work of fiction loosely based on real incidents. Splendid Journey of WOrds and Emotions at different Notions! ODD Relationship..ODD friendship..indeed sometimes turns up to be the EVEN and parallel moments of the Life, perhaps we gotta learn to deal wit it.Yeah..it does hurts! And as i have always beleived that sometimes..we need moments to remember and feel glad to see the hardships happend, or eles it would not hav been a such a success story to tell! Are U planning to get more parts of it...like some more love stories..as m very delighted with these expressions and feel of love in your words. Plz do come up! Shall b waiting for it very very egarly! But it was written wonderfully! Hats off to you. The narration was simply too good. Write more stories in future. Here's my feedback for you pal. ouch, on people commenting at her pictures. Felt so sad. all hopes gone. a smile again on the picture of love god at the end. Finally when I think back, its full of emotions. I loved every bit of it. It reminded me of a beautiful saying that I want to share with you. "there are only two disasters in this world. one is not achieving what you want and another one is........achieving what you want". Hi Vipsy, I didn't comment on your last two posts, just to say Oh boy, am expecting your next part to this cute, sweet reflection of yours. But finally, the much awaited final part came and when i saw the tag (On FB early this morning), I immediately logged into blogger account to read this!! This post is full of emotional agitations.. In the end, I found really sorry for you. The narration was too good in the first and last part. But I couldn find a similar rhythm in your second part..
Now jus keep your hand near your heart and say "Allll izzzzzzz well"..
@Rachana.. Hey thnx for such sweet and empathic words..
@Ash.. Hey, that was a real nice confession u made here.. I am happy that I could put fwd a perspective which sum ppl didnt comprehend till now..
well definitely this is js one side of the story.. she mst hav hd her reasons nd only she knows thm best..
your way of expressing and usage of words is good!!!! d frst part was absolutelyyyy fantabulous, d secn part enagaging n d final...emm well kinda buhoooo....but i mus say i thoroughly enjoyed it....cours if its true, den sadly at ur expense...hee! and god forbid, if it is inspired from life than, i know how much that would hurt..
some on the other hand, are made to end even before they start. It surely hurt while writing it and each time i read it, especially the third part, the emotions are rekindled.. bt thn it is the past.. It's so beautiful Vipul! I know how much it hurts when someone rejects you with reasons known only to them. I had been in the position of your lady love but I finally gave up and accepted his love. It's only after then that I realized how much pain I had given him with my unpredictable mood swings. And BTW, you should certainly write a book :) You are too good! So beautifully written. What I liked best in all the 3 parts is, It was so natural and I know this is a work of fiction, but I felt it came straight from your heart. Specially in places where you describe how you feel at a particular instance, it's written so very well.